This is another one of those keeping it real posts. Because the best way for me to keep it real is to talk about the library. And mice. And why they haven't sent me a cease and desist order and told me I can never check another item out E.V.E.R is beyond me. Other than the Jamaica DVD in the middle (the only one without big red warnings), I don't have clue #1 where any of the other books are. 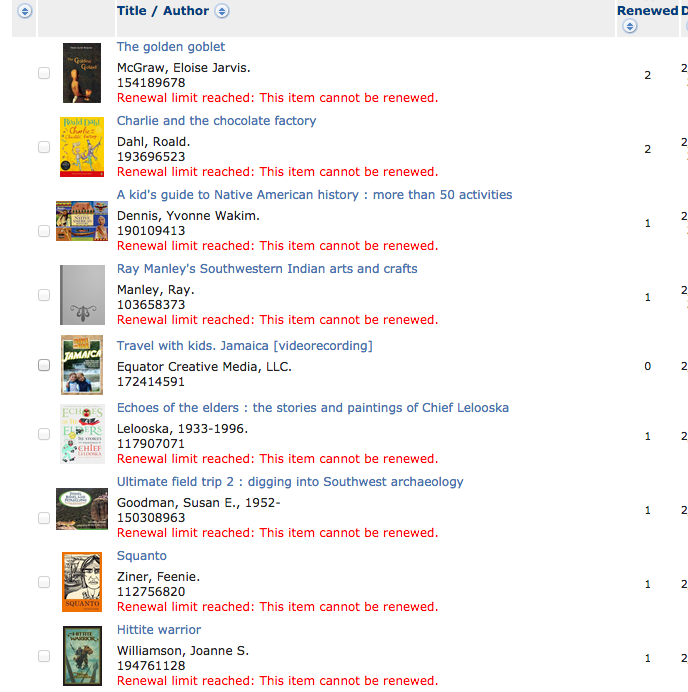 Honestly, I am nearly certain that I returned the Native American History, Southwestern Indian Arts, Squanto, and Southwest Archaeology, but the librarian did a whole bunch of digging and she did not locate those three at all. I know I did not return the three novels. I have no idea about Echoes of the Elders. Regardless, though, I have eight totally missing library books. On a just as frustrating note, in the search for the above books, I ran across a dead mouse. <shudder> And Thomas found a dead mouse in one of those cartons of seafood broth. You know, not something I'd normally purchase. If the mice have to commit suicide by drowning themselves in broth, couldn't they choose chicken broth? With the amazing weather we've had lately, we've had an influx of mice. Again. I hate mice. I also hate missing library books. I'll update and give you the ghastly total I end up owing to the library. Those are some expensive books there, so it is going to be awful. I'm sure the fact that I'm still sick doesn't help my attitude toward either the books or the mice. Feel free to tell me I'm not the only one losing things. If you are perfect, just move along. This is not the blog for you.